Sehr geehrter Herr Bundesaußenminister Steinmeier! To whom it may concern: We are writing this letter to express our anger, dismay and sadness at the death of fellow human rights defender Ms Cao Shunli in hospital on 14 March 2014, following months of detention where she was not given access to adequate medical attention. 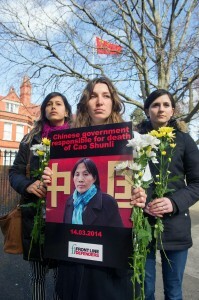 Cao Shunli was disappeared and subsequently detained in September 2013 as she attempted to board a flight to Switzerland to participate in a UN human rights training programme. For years Cao Shunli had been lobbying for greater civil society participation in China’s drafting of its national human rights action plans and in its UPR reports. Despite the difficulties – the harassment, the arrests and the imprisonments – Cao Shunli continued to use the UN system to try to improve China’s human rights standards. After she was detained on 14 September 2013, reports quickly surfaced regarding Cao Shunli’s medical condition and the fact that she needed urgent medical attention. In response to a public statement (http://www.ohchr.org/EN/NewsEvents/Pages/DisplayNews.aspx?NewsID=13860&LangID=E) issued by a number of UN human rights experts on 16 October 2013 expressing concern about Cao Shunli’s condition, the Chinese government formally responded (http://www.ohchr.org/EN/NewsEvents/Pages/DisplayNews.aspx?NewsID=14394&LangID=E) saying that she had no serious health problems and enjoyed access to medical care. The Chinese government deliberately deceived the UN on this occasion while continuing to detain Cao Shunli, refuse requests by her lawyers for medical parole, and deny her access to adequate medical attention. The only reason she was punished in this way – murdered, in fact – is because she wished to work within the UN system. Astonishingly China is now a member of the Human Rights Council. There have been other cases in the past where human rights defenders, such as Li Wangyang and Li Hong, have died at a result of mistreatment at the hands of the authorities, and in these cases the Chinese government did not carry out an independent and impartial review to investigate the circumstances of their death. As such, we do not trust the Chinese government to reveal the real circumstances behind Cao Shunli’s death. We call on the UN and the EU to demand that the Communist Party of China agree to the establishment of an independent special commission of inquiry to investigate these circumstances, including the interviewing of all relevant health care workers who treated Cao Shunli and members of the security forces who presided over her detention. We further call on the UN and the EU continue to monitor the situations of other human rights defenders in China who are in prison because of their work, especially those in need of medical care.